Kathy - I love the 2 tone leaves...they're just like Ma Nature makes! Also, the girl with pumpkin stamp is by Whimsy. Trudeenr wrote: Kathy - I love the 2 tone leaves...they're just like Ma Nature makes! Nice job Koren! I love that feather stamp. Koren, you did a fantastic job! I'm glad you were able to incorporate feathers, as well. 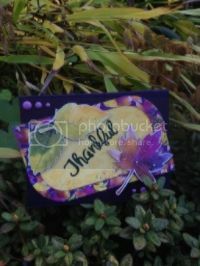 Trudi, Kathy and Koren, great way to use the colors on your cards...each one of you did awesome. Koren - I love the sentiment image you used. I found this DP at our Ben Franklin and I couldn't resist the purchase. This line of paper is so beautiful. I think I got the colors there is pink, purple, green and yellow. Nice and difficult challenge Golda. Sorry I didn't put in a feather.